After much deliberation, I have decided that I am going to give up on therapy. It’s ironic I guess, that this is what I am training to be yet, I find that it is not right for my own things. Maybe, I am just a better listener than a talker. Recently I did a session of EMDR. This was probably the session I realised therapy is not for me. I cannot connect with this therapist or any that I have gone to, before him. The textbook answers, and the fact that they are paid to listen, hinders my mind, and I know that really, they don’t care. How can I give my darkest, and deepest things that are so hard for me to say, to someone who after I leave, will probably think nothing of me for more than five minute?. I found myself going over this in my mind a lot and then I thought about the therapy itself. I really don’t think healing is a thing that is possible, not in a way that it is all gone. How can a lifetime of things be undone by talking to someone? How can the broken parts of me ever be put together the way they were so long ago, when its before I can even remember? The most I can hope for is to learn how to calm the child inside. To care for him when he is sad or upset. To understand when triggers happen, and not to fight them, but to sit down with that part of myself, and just allow it to be there. I’m not really sure how I will achieve this, but as I learn more and more in my psychology classes, I understand myself better, and the child from long ago. 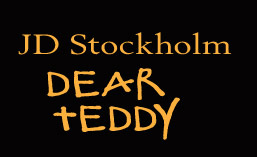 Writing the Teddy books helps me. It’s giving him a voice when he has never had one. I am not sure what I will do when I finish this final one. I plan to write it all to the end now; Teddy 3.5 as it is called, and if you have read my others, then you understand why I cannot called it Teddy four. My father suffered a heart attack recently, and whilst I know many readers of my books will perhaps think, this is a good thing, I found myself shocked at my own reaction. I put the phone down after I had been told, and wondered what if he dies. That would be it. I would never have a chance to tell my father what I thought, and never the chance for him to be a father. I know these things will never happen. I have to find some way to accept that. I think what shocked me the most, was my own upset and breakdown, on the phone. So much of a breakdown that I couldn’t even talk, and someone else had to take the call for me. I realised that I care, somewhere inside, for my father, because he is, after all, my dad. This entry was posted in Journal Entries., Therapy and tagged EMDR, help, teddy, Therapist, Therapy. Bookmark the permalink. JD. I am a believer that EMDR works. It just requires the right therapist. As I’ve discovered, a therapist that works for you is one that fits with you. It’s not the therapy that is bad it’s the fit. The ability to make the connection with the therapist. Like a pair of shoes. They have to fit just right before wearing them is comfortable. I think I’d go through every therapist going sometimes. Unfortunately therapists are TAUGHT to be emotionless even if they would like to absolutely hold you and say things that would make your hair curl about what all has happened to you in your lifetime. So I cannot fault you or criticize you for these decisions based upon the facts that they “listen”, but they are constantly waiting for your to find your own answers, it seems to me, anyway. I think that there are probably coping mechanisms that you could discover on your own if therapy is not working for you. Such as instead of THIS, I will do THAT. I think you should buy a recliner for instance and place it in your living room to sleep in so that you don’t have to wait for the feeling that someone is lurking in your hallway about to come into your bedroom or something like that. I, myself, can fall asleep much faster in the living room watching T.V. than I can going to bed because the minute my head hits the pillow, all the worries of the day come back to haunt me and I wonder what noise I’m hearing (which is usually the ice maker). lol! It is possible your father will one day apologize and admit he was wrong. I wouldn’t just expect it, however. There’s too much life left to live to be just waiting for it to happen. Yet, of COURSE, you care about him. There is some small, young part of you who does remember when he was kind in his fashion. Plus the yearning that every child has that their father will at last be the kind of parent that you really need them to be. exactly to everything you said. they feel cold and unconnected because they are taught to be. and yes what you said about my father. as to sleeping, I sleep in my lounge on the sofa, it’s not as frightening as a bedroom, but still I wake wondering where I am. I imagine you do sometimes. At least I suppose you can get power naps though. Sigh. Seems your education is turning out to be the best therapy of all for you. Understanding the child within. I’m so glad. For you and for that little boy inside. I’m glad you are finding a way to make his tears finally stop. Maybe the broken pieces can never quite be put together, as you said, but I guess that is always people’s misconception about trauma. To heal it and glue pieces back together again. It can’t really be done, though, can it? You can’t just disregard everything you’ve been through. You can, however, kind of find a way to live with it as peacefully in mind and soul as possible. I love how you say you just want to learn how to calm the child inside, to care for him when he is sad or upset and to understand when triggers happen, and just allow them to be there. I have always said, I will support you no matter what you decide. Today is no different. I know I have said it way too many times, and you’re probably tired of hearing it, but sorry, I have to say it again; I am proud of you, James. Proud that you have come so far. That you have faced your past head on, in an effort (many efforts) to help yourself. That you had the courage to try. That you did your best. And most importantly, that you followed your heart. We all have our demons and we all have our journeys. But when it’s all said and done, we are the ones who must live with ourselves. And so, you must do what you feel is right for James (and Jamie). What makes you feel safe, comfortable, and able to continue on with your journey, and to deal with your demons accordingly. I am so glad you have found some answers A few tools. Many new friends. Acceptance. Understanding. Respect. Support. Admiration. And a LOT of love; things I know you didn’t think you were deserving of. You are more than simply a number or a name on a file tab. You are James. You are beautiful. And yes, you are indeed loved. I only recently became aware of your blog, so I do not know your entire story. I endured abuse from a very early age. My journey has been long and difficult, but i found a therapist that I truly connected with 25 years ago. He is a truly compassionate man that i have a deep respect for. I hope that you are someday able to find the right person to help you through your journey. I will continue to follow your story. I support you and your search for peace. I pray for you daily. Hi JD. My name is Yamilé Nadra, and we are friends on Fcb. I answered to this post there (much personal information, but only to explain why I can relate to your feelings about therapy). I hope it helps. A big hug! !